It’s been so long since I did freeform peyote work that I had forgotten how much I enjoyed the freedom of it. 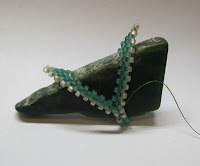 For the past several years I’ve primarily been doing a lot of geometric beadwork which is rigid in form and structure but still creative in application. Once I got started on the first ring, the joy of freeform expression was familiar and inviting, much like reconnecting with an old friend, and I savored the chance to fall back into those comfortable rhythms. Spring is my favorite time of year and I can’t wait to see everything wake up again and return to life. The first ring is inspired by the first apple buds and leaves that sprout from dormant branches and yearn for the Spring sun. 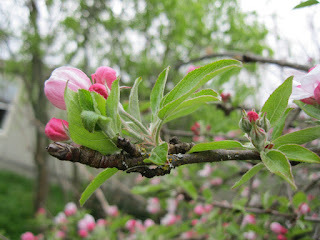 At our house, the apple tree vibrates and hums as the bees find the bounty in their early blossoms. 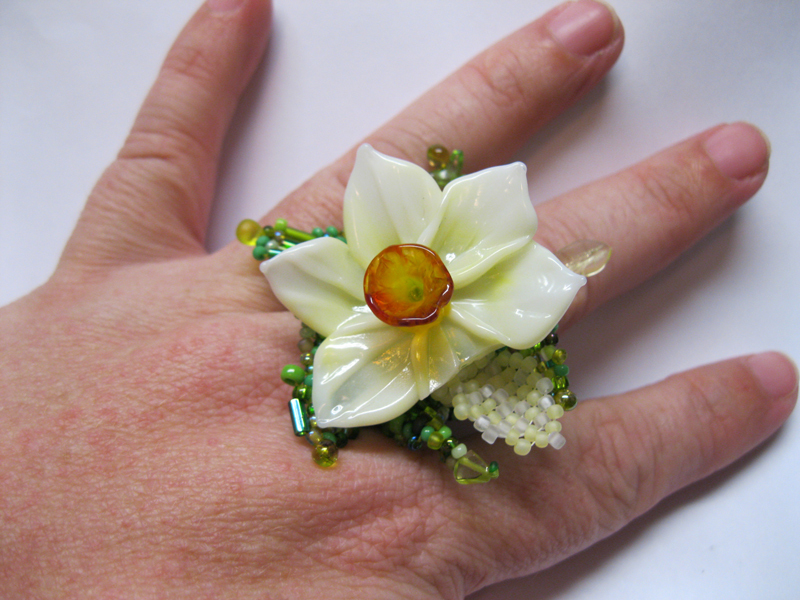 The ring, Apple Blossoms, was started shank first with a single row of beads followed by several rounds of freeform peyote. The branch, leaves, and blossoms were beaded separately and then attached to the shank through a flat washer looking trade bead which has an added bonus of allowing the branch to rotate on top of the shank. After the first ring was well under way, so many more Spring Fling ring inspirations hit me all at once and I wondered if I’d find the time to create everything I was exploring in my head. Daffodils are my favorite flower and one of the first Spring flowers to bloom in our yard. 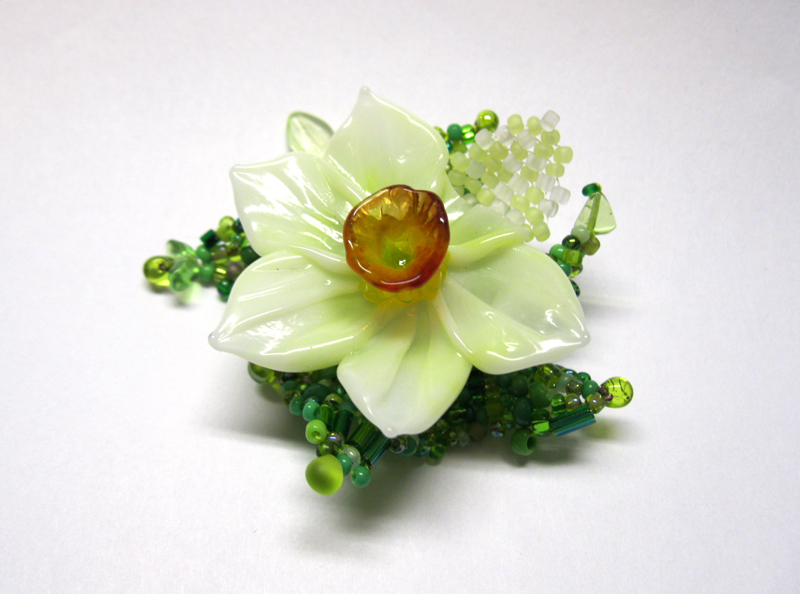 Several years ago, I purchased a lampworked daffodil bead from Serena Smith at a local bead show and tucked it into my purse. When I got home, I found one daffodil petal had broken from banging around against who-knows-what in my purse. I kept the broken bead and figured I would find a way to use it in time (The beads tell me what they want when the time is right, I have only to listen and wait for their suggestions). 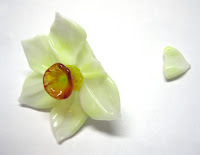 First Bloom gave me the opportunity to use this beautiful but neglected bead. 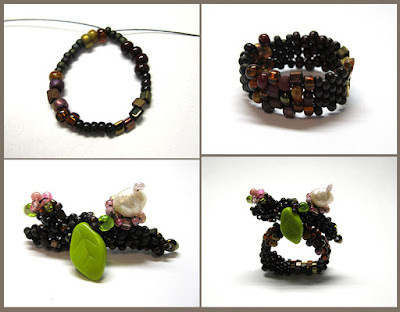 The single missing petal was created with seed beads, then a blend of freeform peyote and 5 sets of geometric herringbone increases was sculpted around the base of the bead. 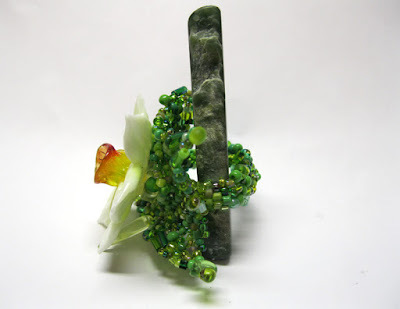 The shank was created and added after the flower, petal, and foliage were assembled. Why stop at two rings when there was a whole month to create and rings only use a few hours of stolen time? Spirals are everywhere in nature and the universe, and I seem to gravitate to this shape so why not explore it in beads. In New Zealand, the spiral-shaped Maori koru is reminiscent of an unfurling fern frond, symbolizing new beginnings – yet another Spring theme. 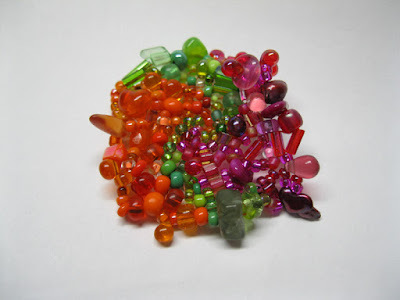 I usually steer clear of pink in my beadwork and never pair pink with orange but a beader friend of mine recently made me some earrings in hot pink, orange, bright green and bronze. Everyone I’ve shown them to loves the color combination so I guess it was time to emerge from my habitually comfortable color cave and see what new paths I could discover. New Beginnings started with the spiral and worked from the center out. The shank was beaded later and has a diagonal transition in two locations between the hot pink and orange colors so they also spiral around the shank. 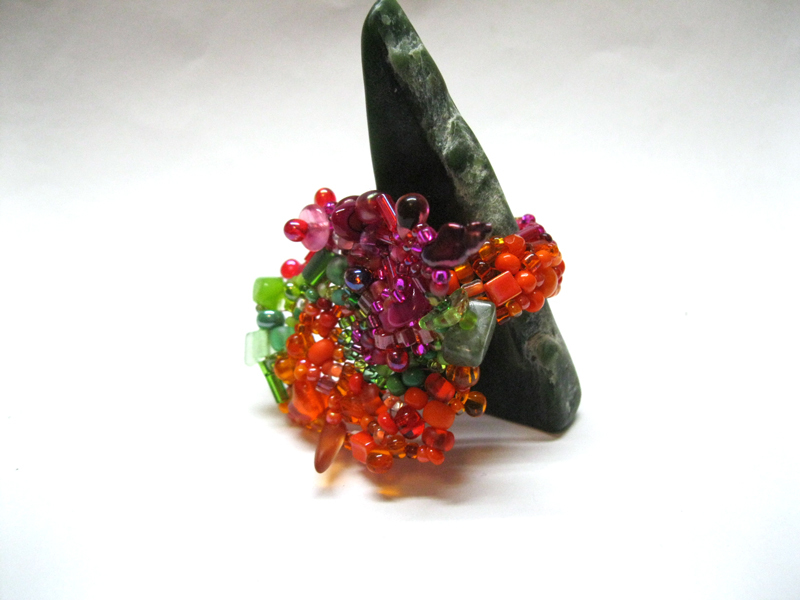 The final ring in this series, Pacified, blends my love of the geometric beadwork with the freedom of freeform peyote. I had an older exploded warped square (technique from Contemporary Geometric Beadwork) in pastel colors which reminds me of the soft, muted sunlight emerging in Spring. The shank is a simple square-stitch connection of two of the warped square tips which creates an open ring base to build from. 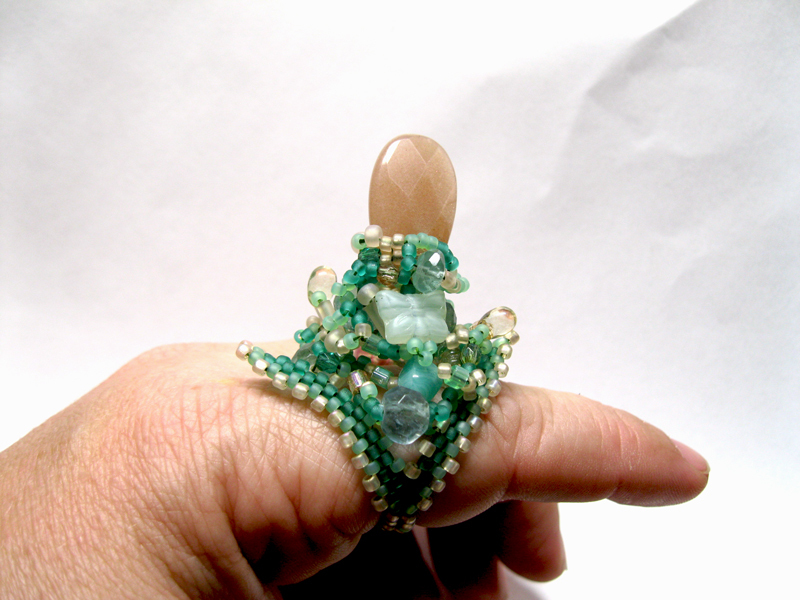 To the base, I added several lacy trusses of netting and introduced peyote in subsequent passes to add structure and support for the heavier beads near the top of the ring. After it was completed, my husband commented that it looked like a pacifier with the center tear-dropped focal extending up so high. Thanks Karen for organizing and facilitating this challenge as well as hosting me as a guest blogger on your site. Teresa Shelton, who beads under the pseudonym Keygirl, has been creating art with seed beads for over 25 years. You can see more of her work on her Facebook Artist’s page or e-mail her at keygirl designs gmail com. Teresa - I so enjoyed getting a 'sneak' peak at your rings, putting together the guest post earlier this week. They are all so unique, and I've had a hard time deciding on a favorite. Your color palette and spiral in New Beginnings really pop - love the addition of the cool lime and the way you've combined beading techniques in several of your designs. Amazing pieces! Truly inspirational, congratulations Teresa!